Before we kick things off this week, I want to give you a quick update on Real Vision Television in response to a ton of emails I have received on the subject. Real Vision will launch on September 8th, and if you have already signed up and registered your interest, you will soon be receiving an invitation to become one of our Founder Members. The opening will be staggered to ensure that the site is robust, so don’t panic if you aren’t among the first to receive your invite. We will be rolling the red carpet out as fast as we can whilst ensuring that the heavy traffic doesn’t crash the website. So far, we have been overwhelmed with the level of interest — not only that which we have received from potential subscribers but, equally importantly, the interest and support we have been shown from within the financial industry itself. The sheer quality of the people who have come forward and are eager to contribute has been nothing short of phenomenal, and their contributions have already translated into some incredible content. Not only that, but we have a schedule of upcoming interviews and presentations that we feel will really demonstrate the power of our simple idea: giving smart people an unfiltered platform in order to bring truth back to finance. If you haven’t signed up to register your interest in Real Vision, it’s not too late to do so, but the window is closing fast. Click HERE to express your interest (you’ll find a box at the bottom of the page, which you click to register). I hope that I see your name on the Real Vision list soon and that you’ll be joining our revolution in the way financial insight is presented, shared, and discussed. I have something different for you this week, folks. Some time ago I wrote a piece on Myanmar, in response to which I received a landslide of emails during the weeks after its publication. At the time, I promised to write further about this amazing country; but, as is so often the case, time has intervened and taken me in ever-different directions. However, this week a chance meeting with an old friend during a truly epic Singapore rainstorm brought Myanmar firmly back to the front of my mind; and so, after a long overdue catch-up with that friend, I find myself once again marveling at what is happening in the country that represents perhaps the last true frontier market in Asia. (Things That Make You Go Hmmm... August 2012): The names of such places as Rangoon, Mandalay, and Irrawaddy evoke memories of a bygone era when the once-mighty British Empire included many far-flung outposts that inspired not only adventure but poetry. One such outpost was Burma, a country of tremendous strategic importance that was conquered by the British after a series of Anglo-Burmese Wars between 1824 and 1885. With the fall of Mandalay in 1886, Burma’s last monarch, King Thibaw Min, abdicated, setting the stage for a little under 60 years of British rule, during which time the city of Rangoon was anointed the country’s capital and grew into an thriving port along the trade routes between Calcutta and Singapore. Many of those years were fraught with unrest as cultures clashed and seemingly insignificant differences, such as the refusal of the British to break with their own tradition and remove their shoes when entering pagodas, were enough to cause severe rioting and the loss of many lives; but the quid pro quo was that Burma became the most-developed and wealthiest country in Southeast Asia under British colonial rule. In April 1937, Burma became a separately administered colony of Great Britain and Ba Maw was installed as the country’s first prime minister. Amazingly enough, Ba was a very outspoken opponent of British rule in Burma (begging the question of how that little fact escaped those in Britain conducting the vetting process); and, after strongly opposing Burmese participation in WWII, he resigned from the legislative assembly in 1940 and was arrested for sedition. It was at this time that an exiled Burmese activist with a family pedigree of resistance (his great uncle had fought against the British annexation of Burma in 1886) named Aung San formed the Burma Independence Army from his base (located, curiously enough, in Japan), and these displaced Burmese took up arms against the Allies. Burma would be decimated by WWII as it became a major battleground due to its geographical significance and the richness of its resources. Though many Burmese initially fought on the side of the invading Japanese army, the vast majority switched allegiance by 1945; and it was in the aftermath of the war that Aung San negotiated the Panglong Agreement, which guaranteed the country’s independence and firmly established him as the father of modern Burma. Aung San was tragically assassinated by political rivals six months before his dream of an independent Burma was finally realised; but despite this setback, on January 4, 1948, Burma finally became an independent republic with Sao Shwe Thaik as its first president and U Nu as its first prime minister. The next 14 years were relatively stable and reasonably peaceful after the turmoil that had gone before. It was during this time that Burma’s U Thant became Secretary General of the United Nations (a position he would hold for ten years), taking with him to New York a young woman named Aung San Suu Kyi, daughter of Aung San, as an administrative assistant. This young woman was later to win the Nobel Peace Prize in 1991 and play an enormous role in shaping the country — but that is a story half-written, to which we shall return shortly. In March of 1962, however, darkness descended upon Burma when a military coup d’état, led by General Ne Win, overthrew the government, plunging the country into decades of violent misrule by an oppressive junta. In 1974, a new constitution of the Socialist Republic of the Union of Burma was adopted, which instituted a one-party socialist system. The good news? It led to the resignation of the military rulers. The bad news? They continued to rule anyway, through the Burma Socialist Programme Party (BSPP), and virtually destroyed the country, turning it into one of the most impoverished nations in the world through their rule based on the toxic combination of Soviet-style central planning and superstitious beliefs. I know, I know... how could a system that combined two such brilliant ideas possibly go wrong? Periodic protests during this period were swiftly and brutally suppressed; but on the 8th of August, 1988 (in perhaps something of a harbinger for those currently attempting to “fix” Europe — pay attention mesdames et messieurs), a bizarre piece of economic mismanagement was undertaken by Ne Win that would finally lead to his downfall and the installation of a new military regime. He abruptly and foolishly decided to demonetize large-denomination kyat bills — a move that instantly affected Burma’s middle class, turning many of them into paupers overnight and sparking what became known as the “8888 Uprising” (8th of the 8th ‘88). The bloody protests that sprang up across the country were eventually quelled after yet another military coup in September by the State Law and Order Restoration Council (SLORC), which imposed even more draconian conditions upon the poor citizens of Burma than those they had endured under Ne Win. But amidst the turmoil it was the formation, in September 1988, of the National League for Democracy (NLD) under the leadership of that young lady who had left her home for New York a decade earlier, Aung San Suu Kyi, that was to mark this period of upheaval as a crucial turning point for Burma, as it turned away from socialism and inched towards a more democratic structure. Inched being very much the operative word. The following year, the SLORC officially changed the country’s English name to The Union of Myanmar; and, in a move that would make them the laughing stock of repressive regimes everywhere, they promised that in 1990 they would hold free elections for the first time in 30 years. Now, call me old-fashioned, but if I’m handicapping a free election between a brutal military junta and a democratic party of the people, I am concerned with only one variable: is the election truly “free”? If it is (and I think it’s safe to say that such regimes have a fairly spotty record when it comes to such things), then I’ll happily take the points and back the democrats. Of course, such elections are never truly free (no, Mr. Putin, they are NOT. We’ve discussed this before. I’m busy; leave me alone), and so the smart money always goes on the ruling party. But a funny thing happened on the way to the ballot boxes as each of the ruling generals assumed that one of the others was going to fix the result; and, amazingly, the NLD won an astonishing 80% of the seats. Normally that might be a problem for a regime, but not in Myanmar. The military junta simply refused to step down, then quietly set about repressing the populist NLD, imprisoning many of its leaders and placing Aung San Suu Kyi under house arrest, where she remained for 16 of the next 21 years. (Democratic Voice of Burma): He tends to be seen as being sullen, humorless and rather withdrawn, a hardliner, skilled manipulator and an opponent of the democratization of Burma. According to his eHarmony profile he also liked long walks, 1940s film noir, and labradoodles. There must be something about the heat of August in Myanmar, because nineteen years after the 8888 Uprising, the situation boiled over once again in August of 2007; and, amazingly enough, it was not just the repressive brutality of the regime, it was once again economic missteps that finally brought about an angry revolt amongst the people of Myanmar (pay attention, Brussels... pay attention). 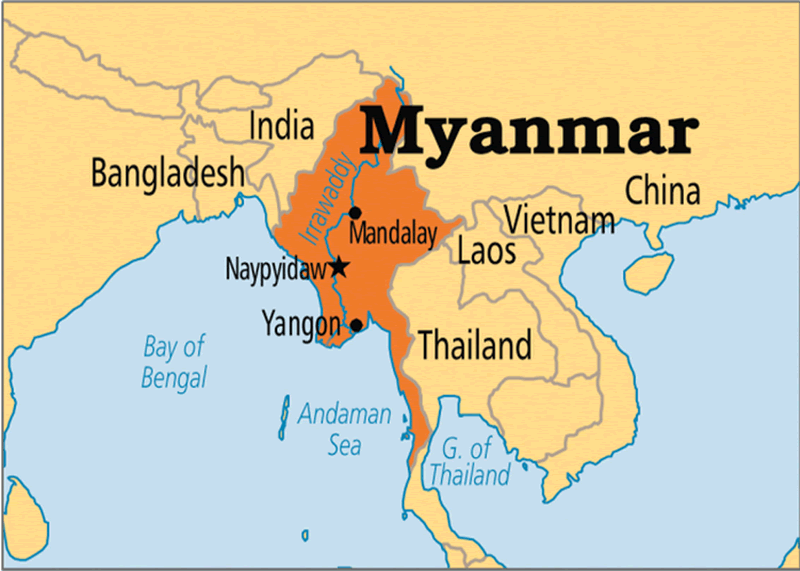 In the wake of what became known as the “Saffron Revolution,” a constitutional referendum was held in May 2008, which promised a “discipline-flourishing democracy” and bestowed yet another name change upon the Union of Myanmar, which would henceforth be known as the Republic of the Union of Myanmar (evoking Monty Python’s Judean Popular People’s Front). But perhaps most importantly, the referendum set the stage for a full and free general election in 2010 (the first to be held in Myanmar in 20 years), which, despite being decried as fraudulent by many Western nations in the wake of a resounding win for the military ruling party, looks to have potentially been the beginning of real reform after so many false dawns. After the 2010 election, Myanmar’s aging military rulers began a series of reforms towards a more liberal democracy and a mixed economy. Their motives were likely selfish as, after years in absolute power, they were wealthy beyond imagination, with offspring who wanted to travel the world (which was prohibited by EU, US and Swiss sanctions), and they had most likely decided that an orderly, self-determined transition into quiet retirement was infinitely preferable to the alternative. Whatever the reasons, the generals matter little, since, if you talk to citizens of Myanmar now, the feeling is very much that the reforms are both real and irreversible; and the success of the NLD in by-elections held on 1st April of this year [2012 — I know, right?] was a graphic illustration of this profound change, as Aung San Suu Kyi’s party swept 43 of the 45 constituency seats available, and she herself took a seat in the Pyithu Hluttaw (lower house) of the Burmese parliament, representing the constituency of Kawhmu. Such events had been inconceivable only months earlier, but with the visit of Hillary Clinton to Myanmar in December 2011 (the first visit by a US Secretary of State in 50 years), the imminent lifting of sanctions and Myanmar’s election to the chair of ASEAN in 2014, progress is proving swift and sweeping. Myanmar’s prospects haven’t looked this good in a generation. So... there you had it, back in late autumn, 2012. Since then, things have been moving at an incredibly rapid pace, as the friend I bumped into in the deluge this week explained to me over a beer. Billy Selig has done his time in finance. Over the last twenty-plus years, he has worked at the NY Fed and for a bunch of brokerage houses in the US and across Asia; and during that time he has always shown a willingness to go places others feared to tread. It was that pioneering spirit which led to his announcing to a group of friends in Singapore back in late 2011 that he was going to Yangon. Not for a visit — no. That’s not Billy’s style at all. He was moving there lock, stock, and barrel to try to chase down the opportunities that had captivated him after he had ventured to Myanmar to see what was going on. Billy set up New Crossroads Asia, a boutique research and financial advisory house that quickly became an invaluable source of intelligence for foreigners looking to gain access to and knowledge of a country that had been off the world’s investment radar for 50+ years. There has been a significant amount of change both politically and economically since I arrived; however, in some instances things have now hit a speed-bump as we await some crucial by-elections which will take place in November or December and are the precursor to a general election scheduled for December 2015. Those elections offer the chance to prove once and for all that there is no going back on the proposed reforms, so foreign direct investment is waiting on the sidelines in order to ascertain whether or not the new administration will carry the democratic reforms of late forward and more importantly support a pro-business environment. When I first arrived in Myanmar, it quickly became apparent to me that the main hurdle to overcome if Myanmar was to move forward from an economic perspective was the severe lack of capital and the need for multilateral oversight and lending. Since the country had been in isolation for over 50 years, it not only lacked the capital needed to pay for reconstruction, but the infrastructure and the soft resources to manage it were also nonexistent. My point was that, until the market developed a solid mechanism through which investment could find much-needed credit and the necessary distribution and collection channels, there wouldn’t be much change. Until the World Bank and IMF and other multilaterals entered the market, we would not see much economic development. Now, in August 2014, we in the business community in Myanmar are very excited to see the IMF, IFC, World Bank, and other multilaterals engaging in project development and financing. This is an absolutely crucial step. Billy is right. You only have to look at some of the numbers to get a sense of the true scale of the investment opportunity in Myanmar. Click here to continue reading this article from Things That Make You Go Hmmm… – a free newsletter by Grant Williams, a highly respected financial expert and current portfolio and strategy advisor at Vulpes Investment Management in Singapore. The article Things That Make You Go Hmmm: Myanmar Shadow was originally published at mauldineconomics.com.